Hardback December 2008; paperback April 2009. Buy the paperback edition now on Amazon. “A super-sweet tale.” – OK! “The leading characters are revealed so gradually and with so much care that it’s almost exactly like getting to know people in real life. Such painstaking attention to detail and psychological accuracy could have resulted in a worthy and inspiring plod, but Rosy Thornton writes with a light hand, a lighter heart and a sure grasp of what makes people tick. “Crossed Wires is such a wonderful story that I defy anyone to put the book down once they read the very first page. Rosy Thornton imbues her story with characters so real and believable that they leap off the pages and linger in the reader’s mind long after the last page is turned. “Rosy Thornton’s new novel, Crossed Wires, is about people finding each other in all sorts of ways. The novel stands as a delightful love story, but also a story about families and friendships and the way they strengthen our lives. Thornton masterfully draws the strings of these relationships together in a tight circle of friendship and love. “Ms. Thornton writes romances in the same way that Jane Austen, Barbara Pym, or Edith Wharton wrote romance – it is as much social commentary and psychological portraiture as it is the story of boy meets girl. In this book, Ms. Thornton has created endearing characters with real problems, people you can really root for. That is the driving force of the narrative, what keeps me turning the pages. The characters here are beautifully drawn. Peter and Mina are both outsiders, in a way; Peter as a widower raising two daughters, and Mina as a single mother who also has to referee the relationship between her prickly mother and her wayward sister. And as outsiders, they are happier when they find each other. The minor characters are really well done, too. I love Peter’s friends, the gay neighbor couple, who babysit and offer comfort when needed, and I think Mina’s mother is wonderfully brassy and difficult. “Reading Rosy Thornton’s Crossed Wires was a little like finding a hundred-dollar bill buried in the ground. I really, really loved this book – the push-and-pull of wondering how the story will play out; if Mina and Peter will ever stand before one another, face-to-face; the realistic, heart-wrenching descriptions of parenthood, friendship and sisterhood. I really related to Mina and Sal, and felt very close to them . . . and I adored the twins and their frantic, close relationship. Thornton deftly draws each character and fashions them into people we feel like we really know, or that we could sit beside in a coffee shop. “In this novel, Rosy Thornton has created a cast of characters you’ll love so much that you won’t want to leave them behind when you finish the book. Call centre worker Mina, struggling to bring up her daughter and sister, and academic Peter, struggling to recover from a devastating incident in his life, will have you gripped from the first page. But what made this novel outstanding for me was the way in which the supporting cast was drawn. There are some exquisite characters in this story. The quirky cast inhabit a world that has been skilfully and beautifully drawn. Throughout the story, descriptive details are lushly filled in, giving the story a background that springs off the page. Rosy Thornton covers a number of important themes in this novel with a sure touch. Loss, and how people deal with it, is high on the list, but also we have the highs and lows of parenting, the power of coincidence, the pressure to conform and live life by the expectations of others, and the fear and inevitability of change. 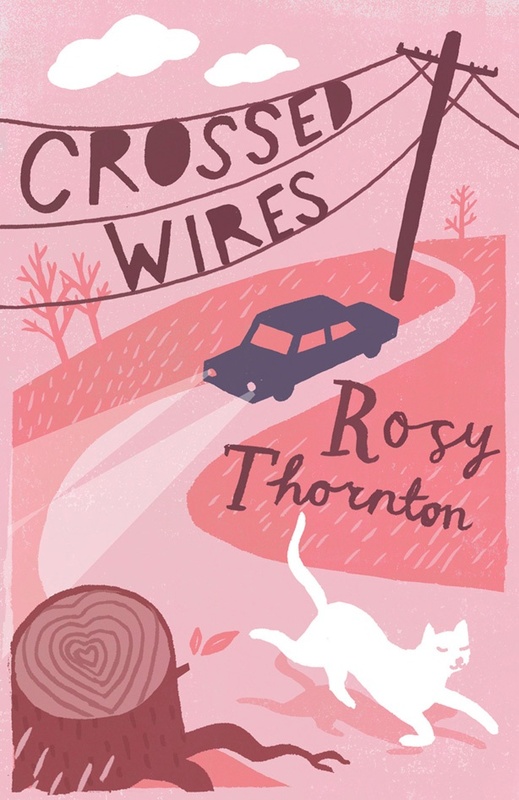 “Rosy Thornton’s Crossed Wires is a delightful novel about parenting, friendship, and love. Thornton’s writing reminds me of Alexander McCall Smith, although (and don’t hate me if you’re a total Smith fan) I think Ms. Thornton’s characters are more authentic, less caricature. “Peter and Mina’s is … a deeply felt, well-imagined, truthful relationship. Thornton has created two characters who are as human as characters can be. They are comfortable and easy and the sorts of people I’d love as friends. And once I realized that this was not a novel in a rush to have the characters meet and become a couple, I abandoned myself to the slow and pleasing pace. “Crossed Wires is a smart, incredibly well-written story about two people lost in the circumstances of their lives. I loved the very English-ness of this book. There was a great feel for location here, from the different class struggles and social norms to the regular taking of tea and the daily particularities of life in an English village. “5 stars – unique, funny, enjoyable – the perfect way to while away a Sunday afternoon. Once I picked up this unique and funny novel I couldn’t put it down. The lighthearted tale of two strangers looking for love sums up the trials and tribulations of single parenthood and shows how easy it is to assume you know what someone is thinking when really you don’t have a clue! This novel is heartwarming and funny at the same time – I found myself sighing one minute and laughing out loud the next.